The United States economy has been taking a hit lately due to the unrest in the Middle East and North Africa. The price of oil, gas, and food rose quickly, hurting the American economy and the financial well being of millions of United States citizens. Up until Monday morning, the stock market had been unaffected by the problems in the Eastern Hemisphere, but that was about to change notably. Monday morning, right when the market opened, the stock market fell hard. 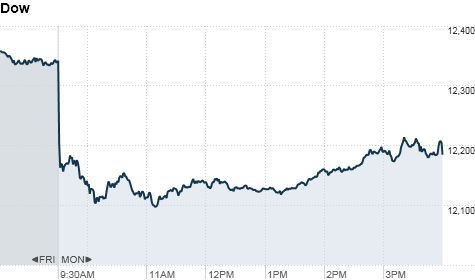 Instantly, the Dow Jones fell over 150 points to start out the day. At the end of the day, the Dow Jones fell a total of 140 points. The fall was a decrease of 1.1% for the Dow Jones Industrial Average. The S&P 500 did not fair much better than the Dow Jones. The S&P 500 also saw a decline of 1.1% on Monday. It dropped a total of 15 points at the end of the day. The Nasdaq ended up just like the Dow Jones and S&P 500. At the end of Monday, all three fell 1.1% each. The Nasdaq also saw an unfortunate 29 point decrease. All three of the indexes did make an improvement from their lowest points in the day. Each of the three had fallen by at least 2% at one point in the day. At the end of the day, 92% of the corporations included in the S&P 500 finished with a loss for the day. So far, April has been the worst month for the stock market since August of 2010. A lot of the losses can be attributed to trouble overseas that are hurting gas and food prices in America. The cost of crude oil by the barrel is also still at over one hundred dollars at $107.12 per barrel. On a positive note, gold and the US dollar both improved. Gold, which is unaffected by political events, reached a record $1,492.90. The dollar index rose by a solid 0.8% and the dollar rose by 1.4% when compared with the euro and 0.4% when compared with the British pound. It is believed that the rapidly growing national deficit of the United States is going to negatively impact the stock market ever more soon. With the Republicans and Democrats arguing about how to deal with the national deficit and debt, it is unclear of how likely it is that the American economy can withstand the potential hits it might be about to see.